A good air compressor with a tank. I use an super-silent professional Italian made airbrush compressor from Sil-Air (30/6) as I painted A L O T of RC car bodies back in the 90's. A good external airfilter and adjustable airflow/pressure of course. An airgun. I use an Italian made one from AsturoMec that is called ES. It has an 0.7 mm nozzle/needle and I paint everything from sanding primer to clear coat with it. 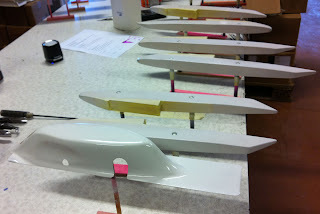 But I would'nt recommend it for painting off-shore boats etc as the 0.7 mm nozzle is too small for that bigger coverage. But for riggers it's perfect size. Ive had mine for many years now (10-15) and it has never failed. Tag Rags (sticky cloths that you use before paint to remove dust). Denatured alcohol to clean the parts before masking. Laquer thinner to clean the airgun with. I mainly use the House of Kolor brand. That's a custom brand that have many different colors and base coats. I buy it HERE. House of Kolor #KS-10Q Ko-Seal II White Base Coat with KU150HP Catalyst & RU310 Thinner. 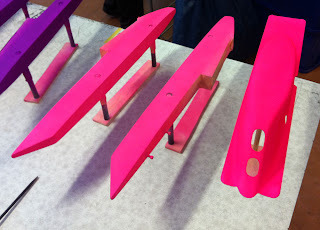 That's used where any Neon color will be painted. 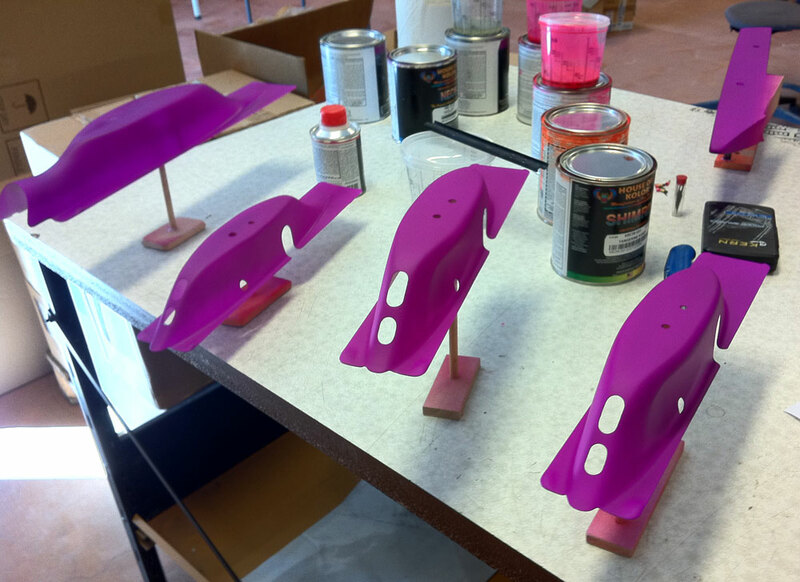 House of Kolor #KS-12Q Ko-Seal II Silver Base Coat with KU150HP Catalyst & RU310 Thinner. That's used where candy will be painted. 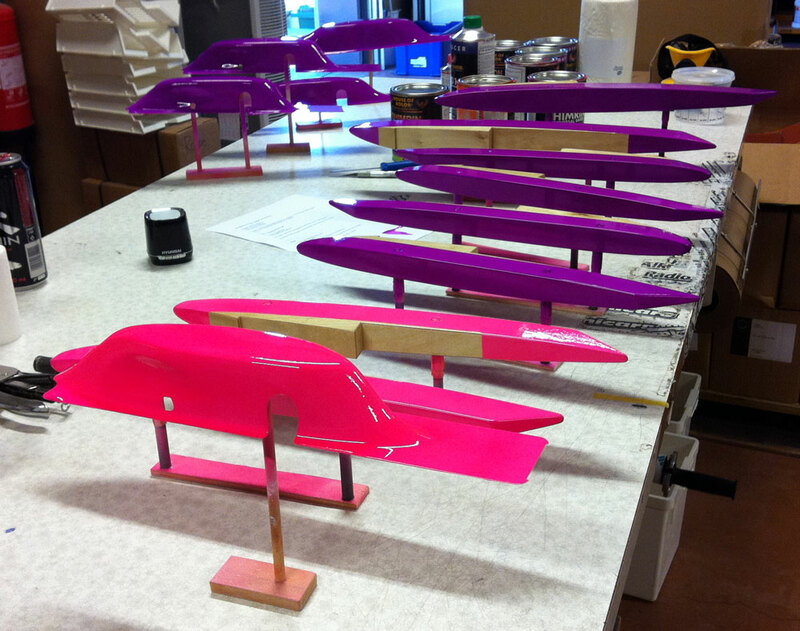 As we race our boats most of us use some sort of Neon. I have used Neon Orange, Neon Magenta on my riggers but this time I will paint my own boats in Neon Violette (purple) and a test pair of sponsons and matching cowl in Candy Tangerine. 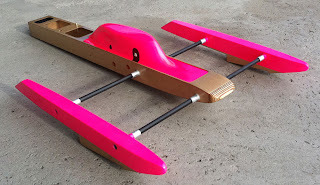 I will paint Sunken's boat Neon Orange and Mattias new 21 in Neon Pink. All by House of Kolor. 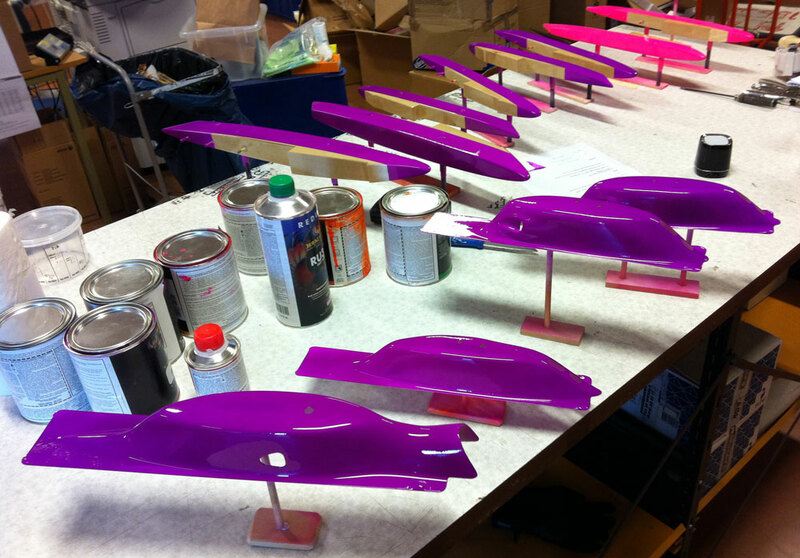 I use a 2K clear coat from Sikkens that is called Autoclear Plus HS - I like that a lot. Everything except my ride-pads and ski's is covered with 3 coats of this clear coat. 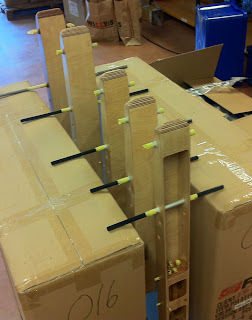 Here the sponsons are mounted on their simple holders and masked. 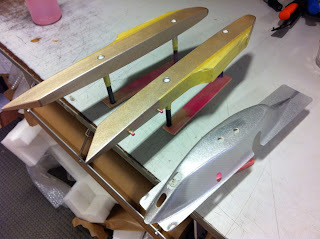 I maske off the bottom part of the sponson - the top part will get paint and the lower part will be clear coat only. Before that they are of course cleaned with denatured alcohol and dust removed with a tag-rag etc. This set will get an first for me - silver basecoat and candy tangerine color! The sponsons are actually covered with 2 layers of silver (same as the cowl) but depending on the view angle it's not visible almost. It's transparent for sure and that could be an issue if you would have laid it on a primer based sanded surface though. The base needs an uniform color for sure. In this case the wood grain will actually slightly be seen through the paint but I think that is cool. White base coat is laid on in 2 coats with flash time in between. 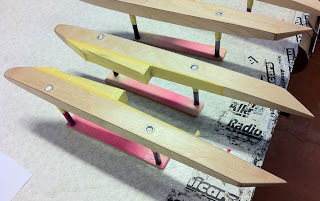 All white parts will get some House of Kolor Neon on them. 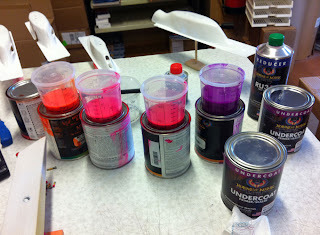 Here are some of the pre-mixed batches of House of Kolor I will use this time. From left: Neon Orange, Neon Pink, Neon Magenta & Neon Violette. 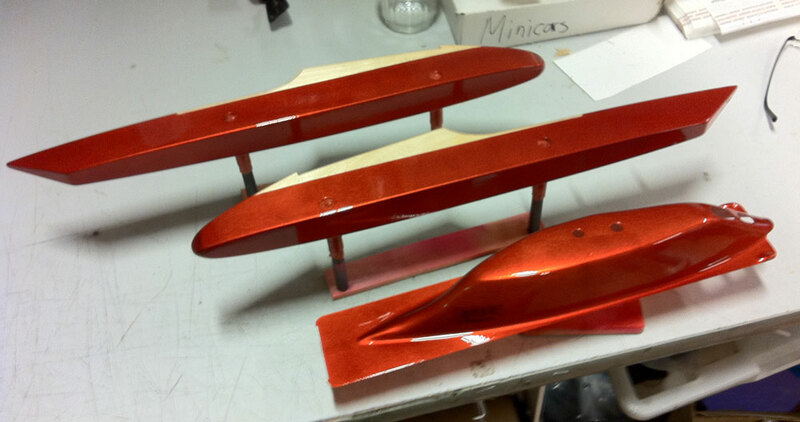 All of them are 1K paints that needs an white base coat and the reducer/thinner is RU310. 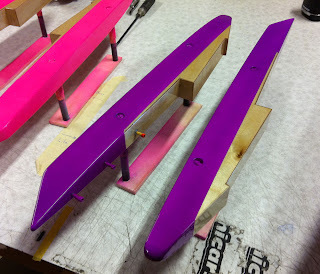 2 coats of Neon Violette is what was needed - max 3 should be used. 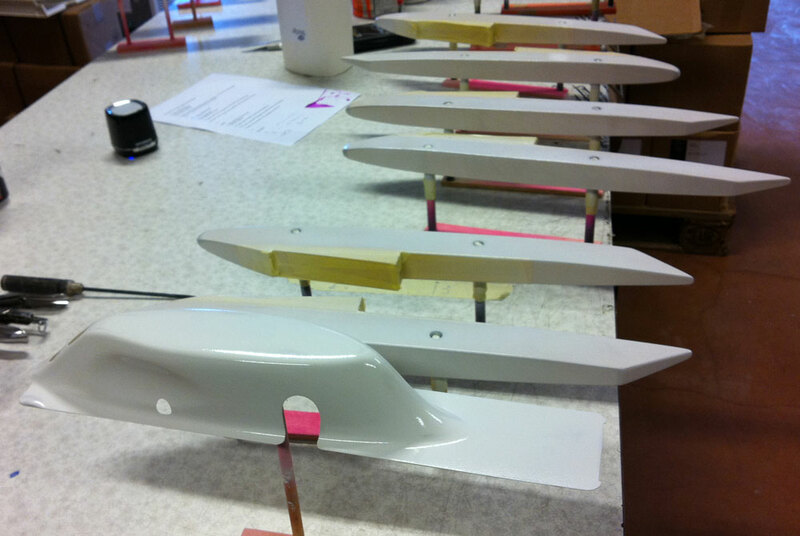 The two cowls to the right are the ones that got some sanding primer in the earlier article. The other tow cowls are molded with clear gelcoat and didn't need any sanding primer - just the white base coat. These are ready to be cleared. 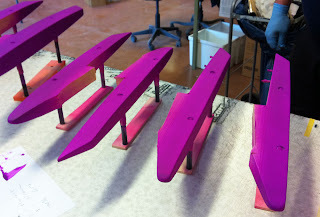 The matching Neon Violette sponsons waiting to be masked-off (the lower part of the sponsons) & cleared. 2 layers of Neon Pink for Mattias Bengtssons T2-21. 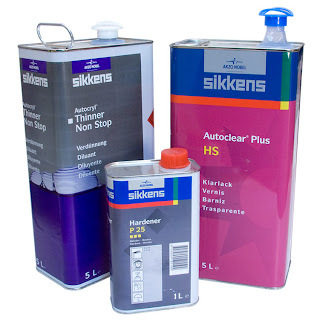 I mixed up some 0.7L of Sikkens 2K clear coat and started to clear everything... Most parts got 3 coats but some was enough with two coats. You should not use more then 3 coats. Neon Violette colored T2-21 sponsons cleared and done. They look way cooler out in the sun but on a cloudy day they might not be that visible... ;) House of Kolor Kandy Tangerine. The tubs are also cleared with 2 or 3 layers of Sikkens Autoclear HS clear coat including the engine/tank bay. 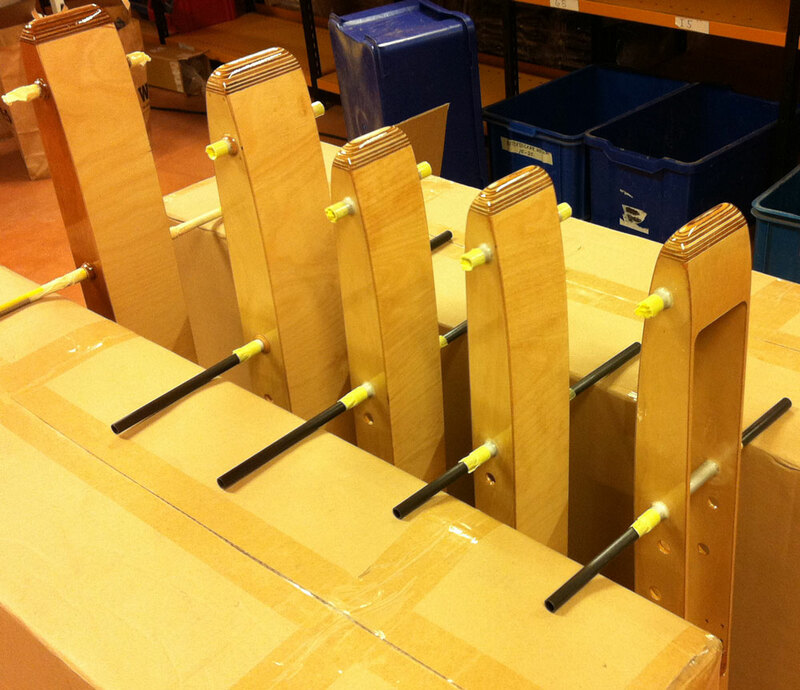 The airgun is cleaned for the last time carefully and everything left over night to set. Minimum 24 hours. This is a mock-up of one of my own new T2-21's the day after - Neon Violette. Looks good in the sun. BUT you should not have newly painted Neon boats out in the sun that much the first few days! Next time I start the assembly! Hi Paul, Im happy you like it. 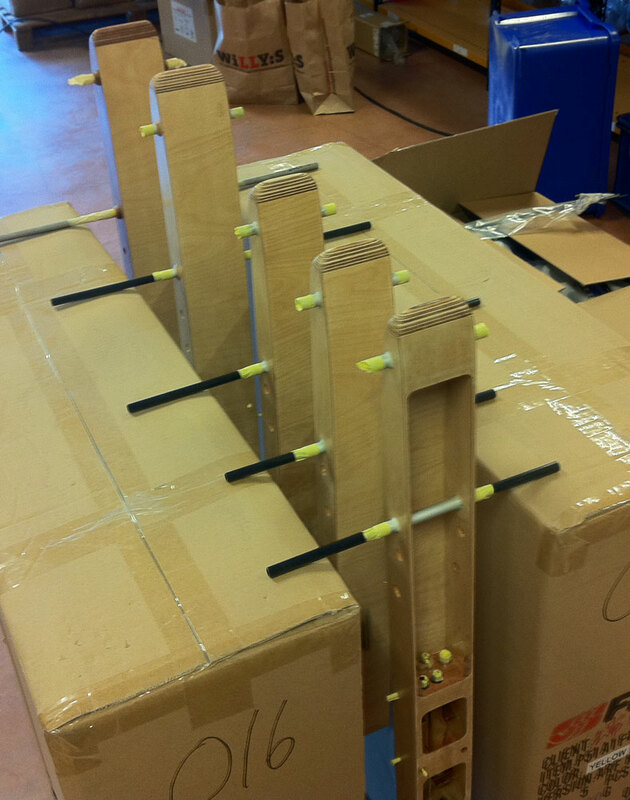 :) Yes, for sure it's a bit harder to build then a JAE (I presume) but it's a good little rigger I think. 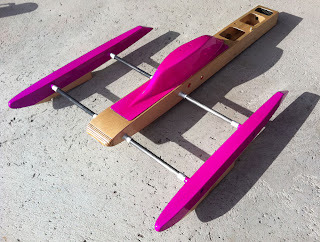 Testing is the back bone of the boat racing. I see it all the time. Please keep me in the loop on the T2-44 testing and design as I would like to build the bigger boat also and see how well it scales up. Good job!